We open with Booster Gold and Blue Beetle hiding out in some low rent motel, trying to figure out their next move to prove Booster innocent. Booster suggests ambushing The Flash, and getting him to figure out what really happened. Beetle reminds him that he already tried that, and Flash beat him to a pulp. Booster tells him, he wouldn't expect the same plan twice... Fist bump! In Metropolis, Clark is having a hard time writing the speech Superman is to give, regarding Sanctuary to the media. Lois helps him the best way she can, but Clark's struggles are more serious than what she anticipates. Booster and Beetle get the drop on The Flash, and manage to knock him out at his lab, and go over the data he has collected. Booster tells Beetle, that something is wrong with the state of Wally West's body, and that it's a week older than it should be. We end with Batgirl and Harley catching up to Beetle and Booster, Harley has her mind set on grievously injuring Booster, even against Batgirl's wishes. Story - 5: The heavy theme of post-traumatic stress disorder is a very interesting topic to explore, especially in the lives of our heroes, and as I stated before, this isn't one of the easiest stories to follow, mostly due to the on-going mystery as to who the killer at Sanctuary is. However, Tom King manages to write some exceptional character moments, making this chapter an enjoyable read, leaving you to wonder "what's next". The mystery continues again this month, without any real answers, however we may have some clues, as both Blue Beetle and Booster Gold discover that Wally West's body is five days older than it should be. Meaning there may be some time traveling chicanery at play. Another interesting moment was Batgirl and Harley "getting the truth" out of Skeets, as to Booster's whereabouts. Could Booster's AI sidekick know even more than he is letting on? There is a wonderful scene of Clark with Lois, as he writes the speech Superman will give to the media, and he tells Lois, that he can hear everyone, and that they are afraid. His turmoil of it being against everything he has worked for in his career as Superman is just one of the great Clark Kent/Superman moments in recent years. Tom King nailed this, just as he did with Superman actually addressing the media and the world, telling them that their heroes sometimes see horrors that continue to haunt them, long after justice is served. I have been critical of King's writing in the past, but there is no denying that he captured the essence of Superman, and conveyed the premise of this series masterfully. Though Batman is used sparingly, I really cringed at the line "I'm Batman, I don't do press". As good as King wrote Superman, Batman felt overly pretentious. Cutting the line in half, and him simply saying "I don't do press" would have gone down far better, but that's just my opinion, King is a far better writer than I am, so I'll trust his and his editors judgement. The Harley and Batgirl relationship continues to confuse me, but I'll admit, I haven't been keeping up with the Bat-books as of late, so I don't know if they have a new found friendship or not. With only a few issues to go, I suspect that the pace of the series will pick up in the coming months, and the reveal as to who is behind the attacks and murders shouldn't be too far away. I love that with this issue, King managed to reenergize interest in the series. I am anxiously anticipating the next chapter, to see the showdown between Booster and Harley, and the Trinity intervening. Art - 5: The brilliance of this book is due in large part to Clay Mann's art. Though I was a fan of his work before, with this series, I have really watched him grow into a better storyteller, and one of the better artists at DC right now. The biggest and best example is the opening page, with Beetle and Booster, as they sit in hiding at an old motel room. 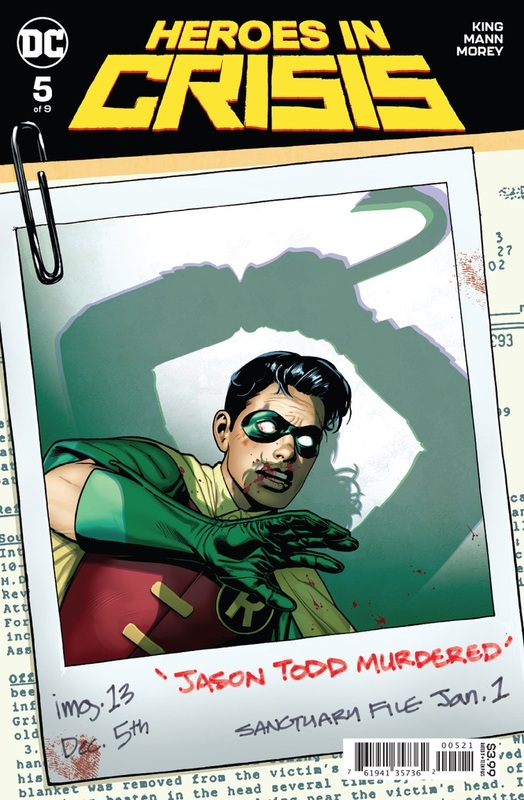 The words Heroes in Crisis are spelled out in the background in the window, Ripped wallpaper, clock, pizza, Booster's boots, and Beetles leg positioning. That is some next level artistry right there. My only criticism is that yet again, we have a guest penciller for a few pages, and though he has managed to keep a very similar tone and style to Mann's work, it still feels like being cheated out of what you expected and paid for. What's worse, the credits for the guest artist aren't even written clearly. All we got is "Moore: Pages 8, 12, 13". "Moore" should have gotten better credit I feel. 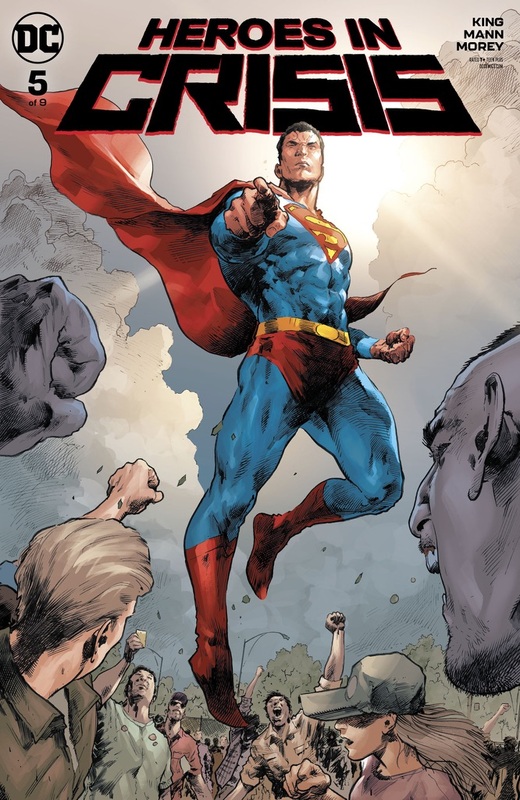 Cover Art - 5: The composition to this cover is great, and wonderfully drawn by Trevor Hairsine, but the reason for Superman to float above the citizens, and pointing in a condemning manner just doesn't seem to convey what the actually is about. Still awesome, and makes you want to pick it up. Variant Cover Art - 5: Carrying on with the traumatic events in the heroes' lives, this month we see the final moments of Jason Todd's life, before his resurrection. What's interesting is, who took this Polaroid shot? Clearly not The Joker, as his shadow is shown, holding the crowbar with both hands.